The future of agriculture is at risk. Walking through your local grocery store you may not see it, but biologists, farmers, and apiarists all know that a crisis at hand. The reason? Declining honey bee populations. Honey bees are credited with being responsible for the pollination of upwards of 33 percent of global agriculture. However, as bee populations decrease all around the world, other pollinators, such as birds and other insects, simply don’t seem up to the task of stepping in and shouldering the workload currently handled by your friendly neighborhood honey bees. More and more, growers are turning to private apiarists, known to most as beekeepers, to supply the “labor force” necessary to ensure that they achieve the harvest yields they are hoping for. To learn more about this innovative and dynamic new technology, continue reading today’s blog from the Pollination Network. Ready to start using the app or have questions for our team of specialists? Visit our website and let us know how we can help. 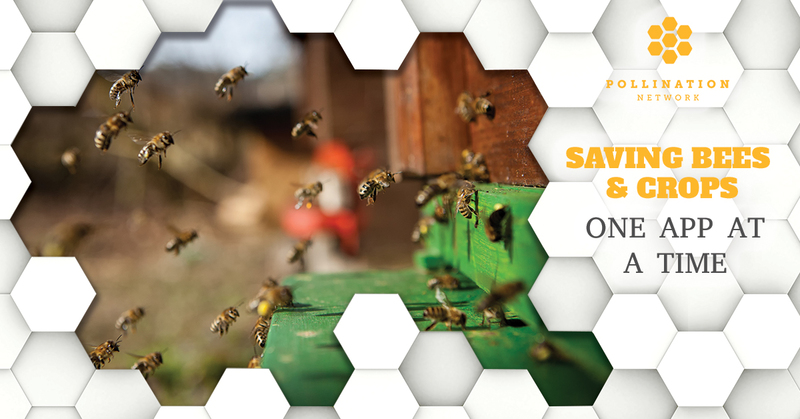 The Pollination Network is an organization dedicated to promoting a sustainable environment for bees — both environmentally and economically — and to connecting farmers and beekeepers to the advantage of everyone right down to the end consumer of goods and foodstuffs. Our app is free, easy to use, and empowers you to find the perfect partners to either contract your bees out to, or in the case of growers, to engage the services of the bees themselves. The purpose of the free app is to create a space for connecting growers and beekeepers to establish both short terms fixes and long term relationships. As a grower, you are able to create a listing with all the relevant details of your job and then wait for the beekeepers to come to you. You’ll have total control over your choice of a beekeeper and can choose based on the advantages they offer that are most important to you, whether that is colony size, type, or proximity to you. Promote your listing and find the perfect fit for your job by including details like your location, job size, crop type, expected duration, price range, and other key metrics and details so that beekeepers can be certain they can meet your needs. Those who have the availability and logistical ability to do so will contact you, allowing you to get back to work and handle the dozens of things that are on your daily to-do list. The beekeepers will benefit from an intuitive and user-friendly map interface that is the home of all of the pollination jobs being offered by growers across the entire nation, allowing them to connect with the growers to whom they can offer the best services and prices. Let the whole community know how your experience was by leaving detailed reviews about the organizations and outfits you’ve worked with. Much like the way reviews work on the interest, this will help promote the most efficient and flexible providers and employers on both sides of the equation, ultimately creating a stronger, healthier market for beekeeping, agriculture, and bees in general. We think that our app is going to revolutionize the pollination industry, and we’re already beginning to see some pretty impressive and promising results. But don’t take our word for it — the app is free, so you can check it out for yourself without any obligation. We are confident that once you leverage the Pollination Network app for your beekeeping growing operation, you’ll continue to use it for years to come. Visit us online today.